I take a walk to the store and can’t help but feel I am moving through something that is more than the atmosphere that rushes by my face as I go. The air itself is contained within the boundaries of the space through which I pass. If I were an astronaut in the vacuum of outer space, I would still have the sense that my motion was through a pre-existing, empty framework of 3-dimensions. Even if I were blind and confined to a wheelchair, I could still have the impression through muscular exertion that I was moving through space to get from my kitchen to my living room ‘over there’. But what is space as a physical thing? Of all the phenomena, forces and particles we study, each is something concrete though generally invisible: a field; a wave; a particle. But space, itself, seems to be none of these. WTF! Way back in the early 1700s, Sir Isaac Newton proposed that space was an ineffable, eternal framework through which matter passed. It had an absolute and immutable nature. Its geometry pre-existed the matter that occupied it and was not the least bit affected by matter. A clever set of experiments in the 20th century finally demonstrated rather conclusively that there is no pre-existing Newtonian space or geometry ‘beneath’ our physical world. There is no absolute framework of coordinates within which our world is embedded. What had happened was that Albert Einstein developed a new way of thinking about space that essentially denied its existence! Albert Einstein’s relativity revolution completely overturned our technical understanding of space and showed that the entire concept of dimensional space was something of a myth. In his famous quote he stressed that We entirely shun the vague word ‘space’ of which we must honestly acknowledge we cannot form the slightest conception. In the relativistic world we live in, space has no independent existence. “…[prior-geometry] is built on the a priori, Euclidean [space], the belief in which amounts to something like a superstition“. So what could possibly be a better way of thinking about space than the enormously compelling idea that each of us carries around in our brains, that space is some kind of stage upon which we move? To understand what Einstein was getting at, you have to completely do away with the idea that space ‘is there’ and we move upon it or through it. Instead, relativity is all about the geometry created by the histories (worldlines) of particles as they move through time. The only real ‘thing’ is the collection of events along each particle’s history. If enough particles are involved, the histories are so numerous they seem like a continuous space. But it is the properties of the events along each history that determine the over-all geometry of the whole shebang and the property we call ‘dimension’, not the other way around. This figure is an example where the wires (analogous to worldlines) are defining the shape and contours of a dimensional shape. There is nothing about the background (black) space that determines how they bend and curve. In fact, with a bit of mathematics you could specify everything you need to know about the surface of this shape and from the mathematics tell what the shape is, and how many dimensions are required to specify it! What this means is that so long as a point in space is not occupied by some physical event such as the interaction point of a photon and an electron, it has no effect on a physical process ( a worldline) and is not even observable. It is a mathematical ‘ghost’ that has no effect on matter at all. The interstitial space between the events is simply not there so far as the physical world based upon worldlines is concerned. It is not detectable even by the most sophisticated technology, or any inventions to come. It does not even supply something as basic as the ‘dimension’ for the physical world! We should also be mindful of another comment by Einstein that “…time and space are modes by which we think and not conditions in which we live“. They are free creations of the human mind, to use one of Einstein’s own expressions. By the way, the 18th century philosopher Immanuel Kant also called the idea of ‘space’ an example of a priori knowledge that we are born with to sort out the world, but it is not necessarily a real aspect of the world outside our senses. 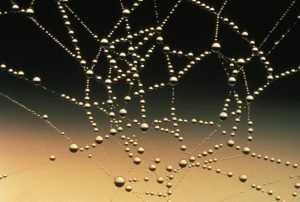 Like a spider web, individual and numerous events along a worldline define the worldline’s shape, yet like the spider web, this web can be thought of as embedded in a larger domain of mathematically-possible events that could represent physical events…but don’t. The distinction between these two kinds of points is what Einstein’s revolutionary idea of relativity provided physicists, and is the mainstay of all successful physical theories since the 1920s. Without it, your GPS-enabled cell phones would not work! So what are these events? Simply put, according to Physicist Lee Smolin, they are exchanges of information, which are also the interaction points between one particle’s worldline and another particle’s world line. If you think at the atomic level, each time a particle of light interacts with (collides or is emitted by) an electron it generates an event. These events are so numerous the electron’s worldline looks like a continuous line with no gaps between the events. So the shape of one worldline, what we call its history, is a product of innumerable interactions over time with the worldlines of all other objects (photons etc) to which it can be in cause-and-effect contact. Even though this new idea of space being a myth has gained enormous validity among physicists over the last century, and I can easily speak the language of relativity to describe it, personally, my mind has a hard time really understanding it all. I also use the mathematical theory of quantum mechanics to make phenomenally accurate predictions, but no Physicist really understands why it works, or what it really means. Next time I want to examine how the history of a particle is more important than the concept of space in Einstein’s relativity, and how this explains the seeming rigidity of the world you perceive and operate within. Check back here on Thursday, December 15 for the next installment!